Desh Bhagat University in association with Chandigarh Management Association (CMA) celebrated International Women's Day with great zeal and fervour. A special function was organised at hotel The Majestic, Mohali, in which eminent educationists, teachers, scholars and personalities belonging to different areas participated. 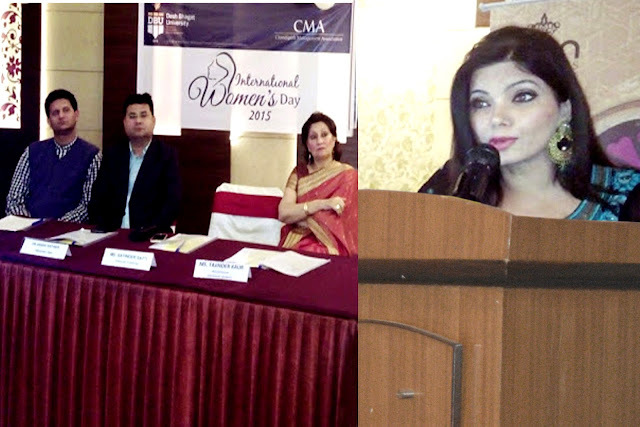 Dr. Anshu Kataria (President, CMA) and Er. Sandeep Singh (General Secretary, CMA & Vice President, Desh Bhagat Group) welcomed the chief guest and other guests. The celebration started with interaction on Condition and Direction of Women in today's world. Famous Television and Cinema artist Ms. Satinder Satti, was the chief guest of the programme. Speaking on the occasion, she said that we are listening from many years that governments have announced major plans for the betterment of females, but the conditions are still almost the same. Now it’s the responsibility of our society and our governments to stop crime against women in all manners, so that we may develop a cultured society. Guest of Honour on this occasion was Ms. Shikha Agaarwal, (a social activist and MD Aren Jewellers, Chandigarh) who expressed that women are contributing a lot in the progress of the society and the country and it’s essential for the society to give them full respect and every kind of oppression against them must be stopped. Presiding over the function, Desh Bhagat University Pro Chancellor Tajinder Kaur announced the launching of Special Scholarship Scheme ‘Shakti’ for girl students of the university. She spoke about women security and said that the thinking of society about women has changed a lot and they are much stronger than before but still there are several miles to go for their full empowerment. But even then she should continue to fight for her rights and not sit still. She regretted that evil of female foeticide and crimes against women are prevalent even today. So the girls should get education and become aware of their rights, so that they can become self-reliant and make their contribution to the development of the country. University Chancellor Dr. Zora Singh conveyed his best wishes to all the women and expressed that we can't imagine a world without women and we must show maximum regard to them. Mr. Jagtaran Singh Nayyar (Vice President, CMA) Mr. Ashok Verma, (Treasurer, CMA) Mr. Gurdeep S. Deep, Sh. P.K Verma (both Past Presidents CMA) Mr. J. N. Vohra, Mr. Surinder Verma, Mr. Rakesh Bhan and others were also present on the occasion.